This being the 50th anniversary of the Buck 110 and all, it got our friendly staff to thinking: What are the most influential knives of the past half century? As with any such list, the parameters must be set. Those would include knives that have been emulated most (unfortunately, this would have to include the many unauthorized copies, knock-offs and downright counterfeits that have long plagued the industry) and/or knives that dramatically changed the knife culture (one observer explained it as “the knife that changed all knives after it”). There are other common denominators among the most influential knife designs, but we’ll stick with these two for the moment. The Buck 110 obviously would have to be in the mix, as its overall look, size, feel and lockback design have been emulated by many. The K.I.S.S. folder designed by Ed Halligan for CRKT has been knocked off/counterfeited perhaps as much as any knife over the past 15 years or so. Michael Walker’s LinerLock™ folder changed the way the industry approached locking folders. Jimmy Lile’s Rambo knife was THE knife of the 1980s and was emulated by scores of factory and custom makers alike. Ernest Emerson’s CQC-6 and/or CQC-7 had a monumental impact on the tactical knife phenomenon that continues to this day. Bob Lum’s American tanto galvanized the industry in the 1980s and is still seen. Spyderco‘s Worker, introduced in 1981, was the company’s first knife with the blade hole and pocket clip that changed modern knives completely. Bob Loveless‘s drop-point hunter was and remains an international sensation. Though not a knife, Bill Moran‘s reintroduction of damascus steel in 1973 and the repercussions and the many spinoffs from it continue to this day. There are many others. Which ones would you pick from the above or add of your own? 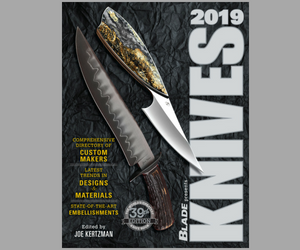 For the latest knives, knife news and more, stay tuned to blademag.com.